Hello, Nexites, and welcome to a new edition of Deck of the Week. There has been some buzz lately that control is actually good in Modern again. We all know that means Cryptic Command and Snapcaster Mage, but really, what’s more controlling than a full-on prison deck? That’s right—Lantern Control has been on the rise, powered by the new tech of Whir of Invention. This weekend Sam Black proved its power in the current meta with an 8-0 performance at the Star City Games Invitational that helped cement his finals appearance. 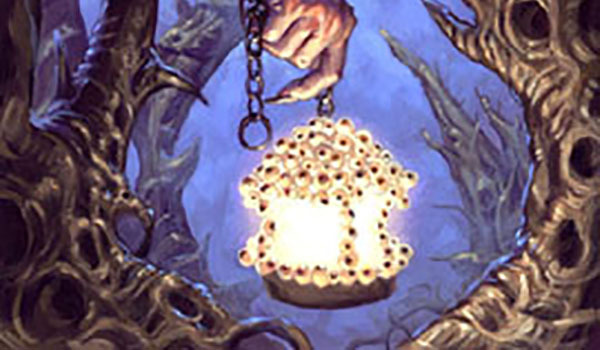 If you’re an avid follower of Modern, by now no doubt you’re familiar with the absurd weirdness that is Lantern Control. This deck has been around ever since Zac Elsik won Grand Prix Oklahoma City with it in 2015. It tends to drift in and out of Tier 2, and now seems to be a time of resurgence for the archetype. Sam’s list is typical of what’s been appearing in MTGO Leagues. If you haven’t had the privilege of seeing this deck in action, or simply need a recap, here’s what’s going on. This deck is pure prison, dead-set on locking out an opponent from relevant draws using the namesake card, Lantern of Insight. A permanent peek at the top of the opponent’s deck combines nicely with the so-called “mill rocks,” Codex Shredder and Pyxis of Pandemonium. These allow the Lantern pilot to control every draw step the opponent gets, effectively shutting down their game plan entirely. Disruption in the form of Thoughtseize, Ensnaring Bridge, and Pithing Needle augments this plan by answering whatever has managed to slip past the draw-step filter. It’s always exciting to see Lantern Control doing well, but the big story here is Whir of Invention. This isn’t Sam’s tech, exactly—it’s a pretty universal four-of inclusion by now in all the MTGO decklists, and paper Lantern players are following suit. One of Lantern’s traditional weaknesses was the difficulty of finding key lock pieces before it was too late, and an overreliance on Ensnaring Bridge specifically. Whir addresses both of these problems neatly, allowing the deck to incorporate a toolbox element to line up the perfect answer to the situation at hand. Past builds tried to use Infernal Tutor in this role, but the Chord of Calling analog from Aether Revolt avoids the problem of having to empty your hand first. Alongside Ancient Stirrings, this suite of tutors ensures that the new Lantern Control will rarely be lacking for a mill rock or Lantern of Insight to begin locking down the opponent. It also means the archetype can afford to run several silver bullets like Grafdigger’s Cage and Witchbane Orb. Sam has elected for only the most high-impact cards in this capacity, but you’ll notice both are well positioned against Storm and Death’s Shadow. Post-board, Whir in response to removal can also fetch up a Welding Jar to act as a protection spell for your most important permanent. Also notable in Sam Black’s list is some sideboard tech in Tezzeret, Agent of Bolas and Search for Azcanta. Tezzeret gives an opponent a one-turn clock to respond if you already have a plethora of artifacts in play, while also finding extra threats with its second ability. It is an interesting piece to side in against control and mirror decks, or even in some midrange matchups where they are already hard-pressed to find a solution to your other artifacts. On the other hand, Search for Azcanta gives you more power to filter your draws, and a very reliable card-advantage engine once it has flipped. I could see both of these being relevant in the grindier matchups, but Tezzeret also provides a much needed win condition outside of the painful (and possibly draw-inducing) Millstone plan. With new solutions to problems that vexed the archetype in the past, and a rise in midrange decks that struggle against it, it’s not hard to see why Lantern Control is doing well. This is a classic example of the “know what you play” mantra in Modern, as learning the fiddly ins and outs will take time and perseverance. But it looks like a great metagame call at the moment, and definitely worth mastering if you have the pieces!